Cycling and walking are the most environmentally-friendly ways to get around Greater Manchester. They create no air pollution or carbon emissions, help reduce traffic congestion and improve your health and fitness. The Greater Manchester 2040 Transport Strategy identifies walking and cycling as the natural choice for shorter trips. TfGM, local councils and other partners have been working to make walking and cycling attractive, convenient and safe ways to travel for everyone. We’ve been building new cycle lanes and improving existing routes, and increasing the number of bike parking spaces available in our towns and cities. Anyone, from beginners through to more experienced cyclists, can take one of our free cycling training courses to help build confidence and skills. We’ve also been making our streets more pedestrian-friendly and improving off-road walking routes. 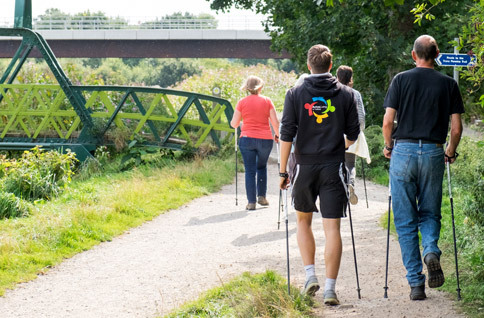 Our work with Greater Manchester businesses is helping encourage their staff to consider walking more as part of their daily commute and outside work. Further improvements will be made through the new Greater Manchester Cycling and Walking Strategy due to be published in 2018. To find out what you can do to help our environment by getting out more on two wheels or on foot, please visit our cycling and walking pages.